Popcorn is one of my favorite snacks, and one I can feel moderately good about eating (most of the time). 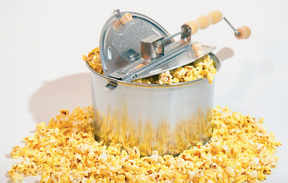 The Whirley Pop stovetop popper is a pain to clean, but the delicious popcorn it churns out makes it well worth the effort. I make mine with a tiny (tiny!) amount of canola or olive oil (less than a tablespoon, just enough to coat the kernels), and I find that once it’s done, it doesn’t need anything other than a (modest) shake of salt. You can make your own healthy popcorn in the microwave, too. It’s as easy as popping kernels in a plain brown paper bag. Find the instructions here. This is so much better than the artificial butter stuff. 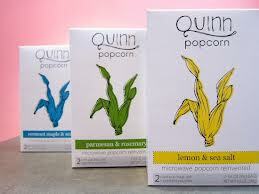 For a real treat, check out Quinn popcorn. Their mission is simple: To clean up the food we eat, which is why you won’t find toxic anything in their products. And with flavors like parmesan and rosemary or olive oil and herbs, it’s hard to choose what to make. We had a Whirlypop for years until we were given a popcorn cart. I’d eat Quinn Popcorn everyday if it weren’t so expensive. My favorite is the olive oil and herbs. Ditto! The price is the only bad part.